We are off to space! Take your mind on a mission of discovery through our solar system, to the furthest reaches of the Milky Way with these out of this world facts about space for kids! Nearly everyone has a fascination with amazing space facts, after all, it’s human nature to want to explore. In this infographic we’ve collected over 100 facts about space – So share this with your friends, kids or students to inspire them! They could be the next Neil Armstrong, Michael Fincke or Steve Swanson and join other inspirational NASA astronauts and scientists that carved their marks in the vast ocean of space. In fact, Australian kids have a rare opportunity to actually meet and learn from NASA staff without travelling to the USA. Thanks to our special program, Mission Discovery, Australian students have a chance to do something extraordinary and literally launch their ideas into space! 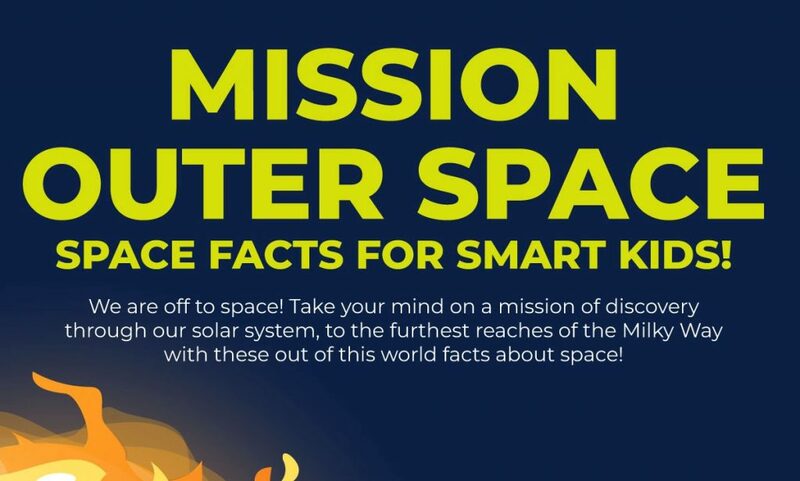 And as a teaser, here’s our space facts infographic that smart kids would surely love. We are off to space! Take your mind on a mission of discovery through our solar system, to the furthest reaches of the Milky Way with these out of this world facts about space! The moon is farther away than you think. When the moon is at farthest point of orbit from earth, you could fit all of the planets in our solar system in the distance between Earth and the Moon. Just how big is the Sun? Everyone knows that the Sun is massive but let’s have a look at just how big it is and few other interesting facts. That’s a diameter 10 times larger than that of Jupiter! Or to put that in perspective, that’s about 110 times the diameter of Earth! The sun could fit around 985 planets the size of our largest planet, Jupiter, inside of it. If you squashed them to ensure there was no wasted space you could fit about 1,300,000 Earths inside of the Sun! The Sun accounts for 99.86% of the mass in the solar system. It has a mass of around 330,000 times that of Earth. It is three quarters hydrogen and most of its remaining mass is helium. The Sun is still growing. The Sun will continue to burn for about 130 million years after it burns through all of its hydrogen, instead burning helium. During this time it will expand to such a size that it will engulf Mercury, Venus, and Earth. When it reaches this point, it will have become a red giant star. The Sun will eventually be about the size of Earth. Once the Sun has completed its red giant phase, it will collapse. It’s huge mass will be retained, but it will have a volume similar to that of Earth. When that happens, it will be known as a white dwarf. The Sun travels incredibly fast. The Sun travels at about 220 km per second. It is around 26,000 light-years from the galactic centre and it takes the Sun approximately 250 million years to complete one orbit of the centre of the Milky Way. It takes eight minutes for light reach Earth from the Sun. The average distance from the Sun to the Earth is about 150 million km. Light travels at 300,000 km per second so dividing one by the other gives you 500 seconds – eight minutes and twenty seconds. Let’s have a look at some interesting facts about the neighbours in our solar system. Mercury is named after the Roman god of merchants and travellers. Mercury does not have any moons or rings. Your weight on Mercury would be 38% of your weight on Earth. A day on the surface of Mercury lasts 176 Earth days. A year on Mercury takes 88 Earth days. Mercury has a diameter of 4,879 km, making it the smallest planet. Venus is named after the Roman god of love. Venus is nearly as big as the Earth with a diameter of 12,104 km. Venus is thought to be made up of a central iron core, rocky mantle and silicate crust. A day on the surface of Venus (solar day) would appear to take 117 Earth days. A year on Venus takes 225 Earth days. The surface temperature on Venus can reach 471 °C. Venus rotates in the opposite direction to most other planets. Venus is the second brightest object in the night sky. Mars and Earth have approximately the same landmass. Mars is home to, Olympus Mons, the tallest mountain in the solar system. Out of 40, only 18 missions to Mars have been successful. Often lasting months and covering the entire planet, Mars has the largest dust storms in the solar system. On Mars the Sun appears about half the size as it does on Earth. Pieces of Mars have fallen to Earth which has allowed scientist to study the planet before launching space missions. Jupiter is named after the Roman god of light, or the king of all gods. Jupiter has 79 known moons, the largest of which, Ganymede, is the largest moon in the solar system. Jupiter’s moons are named are the Roman gods wives and lovers. Jupiter has the shortest day of all the planets with a day lasting only 9 hours and 55 minutes. Jupiter has unique clouds, made mostly out of ammonia crystals and sulphur. Jupiter’s’ Great Red Spot is a huge storm that has raged for at least 350 years. It’s so large that 3 Earths could fit inside it. Jupiter has a thin ring system composed mainly of dust particles ejected from some of Jupiter’s smaller worlds during impacts from incoming comets and asteroids. Saturn is named after the Roman god of agriculture. Saturn has 150 moons and smaller moonlets, but only 13 of which have diameters larger than 50km. The largest moons are Titan and Rhea. Enceladus appears to have an ocean below its frozen surface. Saturn is the flattest planet. Saturn orbits the Sun once every 29.4 Earth years. Saturn has oval-shaped storms similar to Jupiter’s. Saturn is made mostly of hydrogen. Saturn has the most extensive rings in the solar system made mostly of chunks of ice and small amounts of carbonaceous dust. The rings stretch out more than 120,700 km from the planet. Four spacecraft have visited Saturn. Uranus is named after the Roman god of the sky. A day on Uranus lasts 17 hours and 14 minutes. Uranus makes one trip around the Sun every 84 Earth years. Uranus is often referred to as an “ice giant” planet. Uranus hits the coldest temperatures of any planet with minimum recorded atmospheric temperatures dropping to -224 degrees Celsius. Uranus has two sets of very thin dark coloured rings. Only one spacecraft, the Voyager 2, has ever flown by Uranus. That was in 1986. Neptune is named after the Roman god of the sea. Neptune has 14 moons all of which are named after minor water gods from Greek mythology. Triton is by far the largest. Neptune spins on its axis very rapidly. Its equatorial clouds take 18 hours to make one rotation. Neptune’s’ atmosphere is mainly made of hydrogen and helium, with some methane. Neptune has a very active climate with high-speed winds whipping around the planet at up 600 meters per second. Neptune has a very thin collection of rings which are likely made up of ice and dust particles. Only one spacecraft, the Voyager 2, has ever flown by Uranus. That was in 1989. Pluto was reclassified from a planet to a dwarf planet in 2006. Pluto has five known moons, Charon, Styx, Nix, Kerberos, and Hydra. Pluto is smaller than Earth’s moon. Pluto has an elliptical orbit and is at times closer to the sun than Neptune. Pluto sometimes has an atmosphere. When it orbits closer to the sun ice melts creating a thin atmosphere. Only one spacecraft, the New Horizons, has ever flown by Uranus. That was on the 14th of July 2015. Our solar system existing inside of a collection of solar systems called a “Solar Neighbourhood”. A galaxy is made up of millions of these Solar Neighbourhoods. Ours is inside of the Milky Way galaxy which is just one of hundreds of millions, possibly billions of galaxies that make up the universe! Feeling small yet? A light year is unit of measurement to measure distance. It is equivalent to the distance that light travels in one year. Keep in mind that it take light 8 minutes to travel from the Sun to Earth. Now try and get your head around how big the Milky Way is! The Milky Way contains between 100 – 400 billion stars. Our Sun is one such star. Just like our sun, many of these stars are orbited by planets which form solar systems. The Milky Way is approximately 13.6 billion years old and began life as a series of dense regions not long after the Big Bang. Galaxies come in many different shapes and sizes. These formations are broken in to 4 main categories, Elliptical, Normal Spiral, Barred Spiral and Irregular. These categories are then divided into sub-classifications. Our Milky Way is classified as an SBc Barred Spiral galaxy.